a distributing shaft of a machine; a shaft with cams that impart motion to the separate mechanisms of the machine in a given sequence. For example, in internal combustion engines the camshaft allows opening and closing of the valves at the proper times; in fuel pumps the plungers are worked by cam action. Camshafts are stamped from steel or cast from high-strength cast iron. Camshaft cams and journals are hardened to a Rockwell C hardness of 53–62, after which they are ground and polished. the part in the timing mechanism of a machine, instrument, or apparatus that ensures a definite order in the execution of functions and the cyclic recurrence of the operation. In internal-combustion engines, a camshaft is part of the valve-timing system and has a specified number of cams, which corresponds to the number of cylinders. It is rotated by a connecting mechanism from the crankshaft so that the operation of the valves and pistons is coordinated. 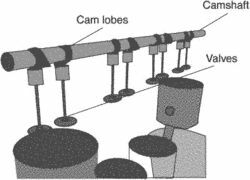 In various automatic machines, camshafts are part of the control systems of production and operating processes that conform to a specified program. Programs can be changed by using replaceable camshafts corresponding to the appropriate operating cycle, or by using camshafts wih cams that can be moved along the shaft or turned to a certain angle, thus changing the eccentricity. A rotating shaft to which a cam is attached. A straight, gear-driven shaft that contains lobes used to operate the intake and exhaust valves of a reciprocating engine. The camshaft is geared to the crankshaft in such a way that valves close and open at the correct time relative to the position of the piston in the cylinders. In case of the base camshaft configuration the isoline of an optimal MFB50 is located at loads where water/fuel-ratios of ~100 % are achieved. As it was said in previous sections using different directions camshaft was designed. 5 million per annum of new business on its camshaft work into the India plant for its European customers. The way I see it, if you view the engine as a piano, and the valves as keys, with a camshaft, you're playing the piano with a broomstick. Most face repair bills of around pounds 1000 after low-mileage cars gave up when the camshafts snapped. Recording verdicts of accidental death, Newport coroner John Matthews said: "One of the causes was a worn camshaft. Announcement to say the camshaft on rear carriage has broken and are awaiting a fitter. NSN 2530-01-446-7969 gets the righthand (curbside) brake camshaft for the truck's rear bogie axle. A timing chain drive system transmits the rotating power of a crankshaft in an engine to a camshaft, and thus plays a crucial function in determining the performance of an automobile engine, the company said. Oil circulation and pushrod length are the same for all cylinders while camshaft lobes are customized for the deactivated cylinders. KP bonded superabrasives can be used in a wide variety of grinding applications, including creep-feed, OD cylindrical, camshaft and slot grinding.